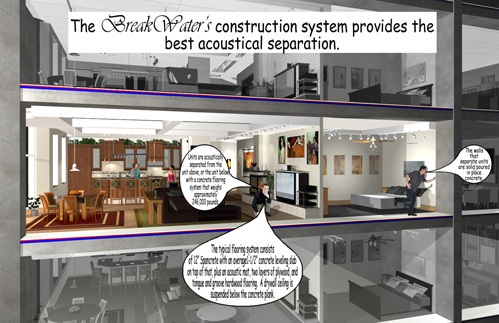 The entire BreakWater Condominium building is designed to achieve the highest level of acoustic separation that can be achieved. The walls that separate units are massive poured in place concrete walls and the floors that separate units are 12” Spancrete with a leveling slab above. Wherever there are hardwood floors we lay a rubber acoustical matt on top of the concrete slab, then two layers overlapping plywood, another layer of tar paper, and then tongue and groove maple flooring. Bedrooms are carpeted. This is the same method of acoustic separation that was utilized at Renner Architects other developments and the results have been amazing.